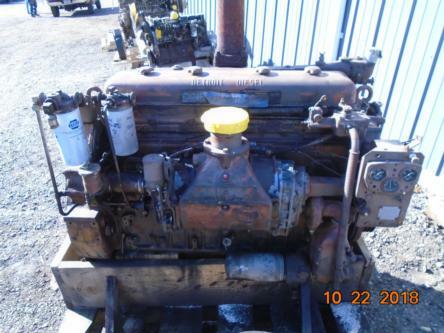 Detroit Diesel DT 6-71 Engine Complete Running Core 6 Cyl Diesel ESN: 6A241136, MDN: RC*6057C, BCN: 5111434 Power Unit Engine configuration and features: SW-VS Gov. Non Turbo, Two Valve Cylinder Head. From flywheel: Blower and governor on right, exhaust and starter on left with right hand rotation. Test ran 9-27-18: Running core with 80 psi oil pressure. Starts hard, had to use either. Prominent lower end noise around #1 or #2 area. Selling as repairable/rebuildable core. As is, As Pictured. O/H kits available.